Most crappies weigh less than 1 pound, but occasional giants weigh 3 pounds or more. While they can be tough to locate and require finesse to land, crappies are a great target for anglers of all skill levels. The easiest time to catch either black or white crappies is during the spring spawn, but many anglers have year-round success by locating suspended schools or those clustered around deep cover. Found throughout the contiguous United States, crappies prefer living in lakes and reservoirs, but they inhabit large rivers as well. Beginners should target crappies during the spawn, when the males are especially aggressive and territorial. The spawn, which usually occurs when the water temperature ranges between 55 and 68 degrees Fahrenheit, causes the fish to enter shallow coves and flats. After the spawn, rising surface temperatures cause crappies to disperse widely and move into deeper water, holding at depths of eight to 25 feet. Fall crappies move frequently and unpredictably, but the fish form dense schools near deep-water structure during the winter. You can catch crappies with virtually any rod and reel. However, an ultralight, seven-foot spinning rod with a spinning reel makes an excellent crappie rig. Cane poles are also effective, especially when fishing with children or in areas with heavy cover. Spool your reel with plenty of 4- to 6-pound-test line. Live minnows are the most effective bait for crappies, who primarily feed on small baitfish. Hook the minnow with a No. 4 or No. 6 hook, and attach a small bobber above it. Crimp some split-shot to your line about two inches past your bobber; use enough split shot to keep the bobber floating upright. If you prefer to fish artificial lures, select those that mimic small baitfish, such as 1/32- to 1/16-ounce jigs tipped with small plastic grubs, or spoons or small spinner baits. Carry an assortment of colors, but chartreuse-, yellow- or white-colored lures often elicit the most bites. You can also attach a live minnow to a jig head if plastic grubs do not prove effective. You can catch crappies from the bank or from a boat. Bank anglers often have the most success by casting toward areas of submerged cover or structure, and then jigging or using a quick retrieve. Boat-riding anglers have more success during the summer, when they can find suspended crappies. Summer crappies often hold right above the thermocline, which is the layer of water where the temperature starts falling rapidly. Try suspending a live minnow from a bobber near this depth. Many anglers troll or drift fish until they get a bite, and then drop anchor and fish the area thoroughly. Whether from boat or shore, chilly winter crappies require a slow retrieve, as they will not chase prey very far. It is important to realize that crappies have very small, delicate mouths. You must use small terminal tackle to enable a secure hook set. When setting the hook, do so gently to avoid ripping it through the crappie’s mouth. 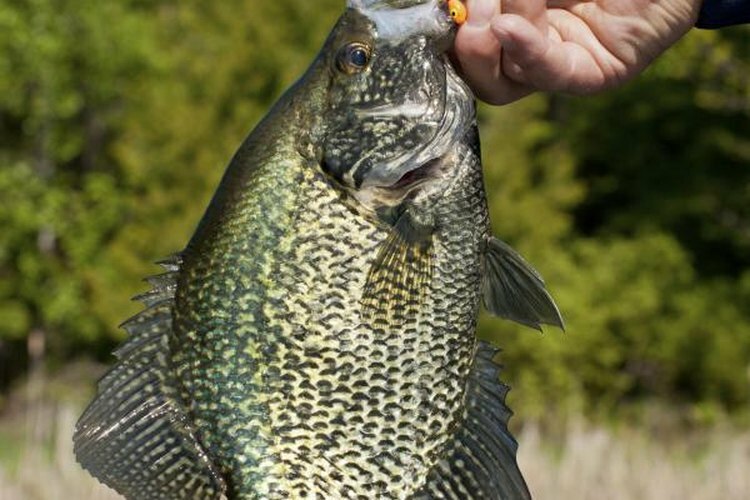 Crappies do not hit lures or baits like bass do – they simply inhale it and keep on swimming. Often, the best way to achieve a solid hook set is to reel up the slack quickly, and apply firm but steady pressure until you can lift the fish into your boat or net.